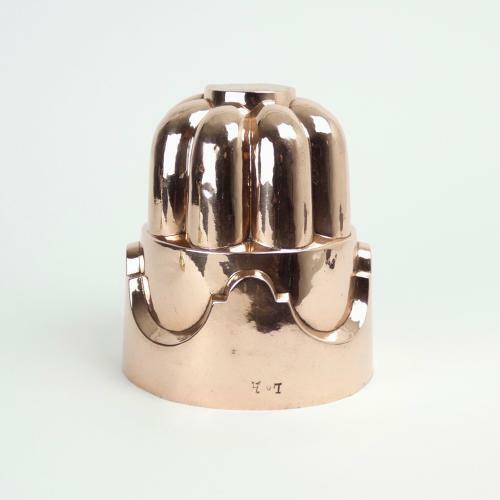 A large, Victorian copper cake mould. This mould is marked with the engraved initials 'L.H', which are now quite worn. These would be the initials of a previous owner. It is probably French and it dates from c.1880. The design is two tiered, with a simple, fluted top section above a scrolling design to the lower section. It is made from quite a heavy gauge of copper. The top section of the mould has been pushed in slightly to one side and there are a couple of very tiny dents to the top, fluted section, but other than that it is in good condition. The tinning, to the interior, is worn and dark.